One of my favorite ingredients to work with is yeast. I know a lot of people have a terrible fear of it but I think it’s just about one of most fun food experiments to undertake in the kitchen. There are so many ways to shape and fill yeast dough and when you pull the pastries out of the oven, it’s really magic to see what has transpired in the baking. The great pleasure you get from working with yeast, the aromas yeasted pastries bring to your kitchen and the great fresh baked taste and texture - it's really super fun. 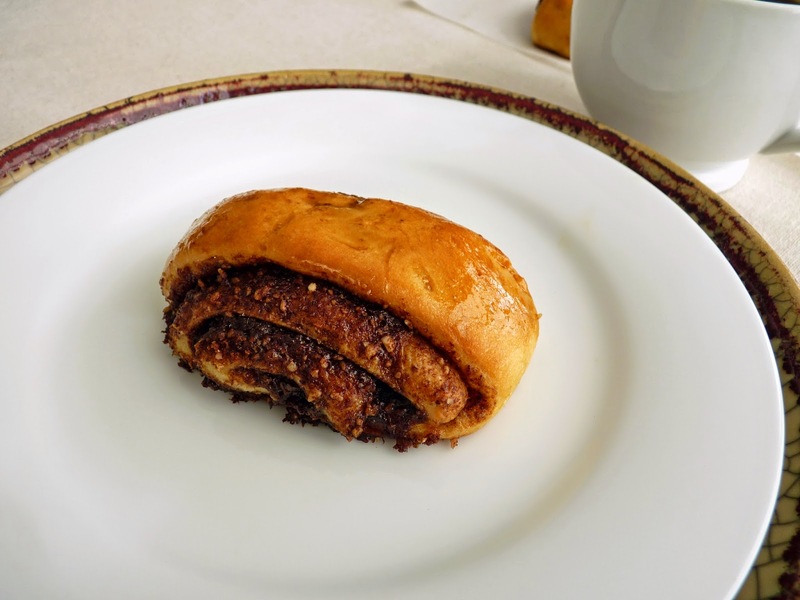 This is a morning bun that is all about the wonderful flavor of espresso in the filling. 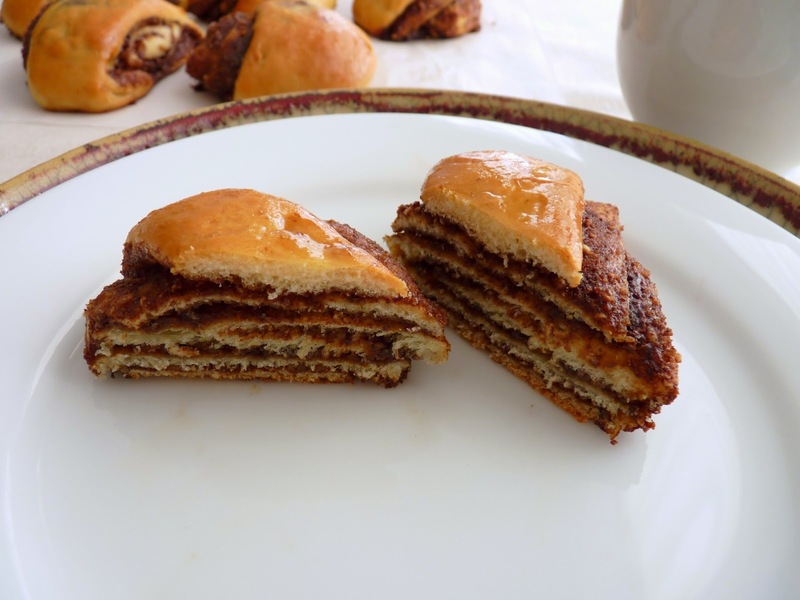 Extending our coffee culture to a yeasted bun turned out to be a very delicious experiment. Since I absolutely love coffee flavored pastries and desserts, this was a particular pleasure for me. 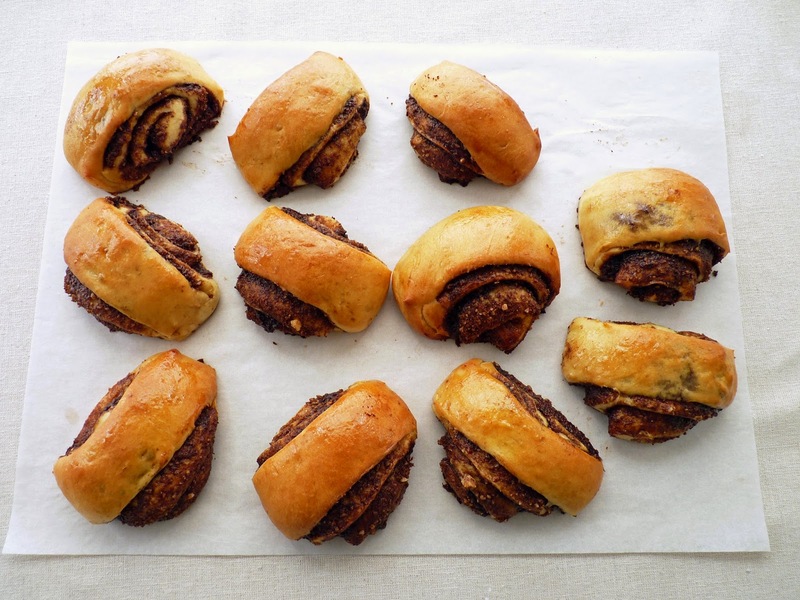 The filling for these buns is also rich with cinnamon. There’s brown sugar, a hint of cocoa powder and toasted walnuts. The whole mixture is finely ground in a food processor for a svelte bite. And for a change in visual appeal, instead of baking them in the traditional way, I placed them on their sides and flattened them slightly to create an oblong shape. As they baked, the slides slid out to create a beautiful little fan. I also finished them with a shiny espresso glaze. One last thing: the aroma of these baking will make you crazy. Let them cool a bit. By the time you brew a good pot of coffee, they'll be ready for your unbridled enjoyment. - Instant espresso powder is very handy to have on hand. My favorite brand is Medaglia D'Oro because the granules are superfine and if it’s kept free of moisture, it doesn’t clump. I've also used Ferrara. It stores indefinitely and can be used in lots of pastry recipes when you want to strengthen a coffee flavor. - The most important rule to follow is to dissolve your yeast in liquid that is 110 - 115 degrees F. It should feel very warm, not hot. I usually just let my tap water run to its hottest temperature, measure out what I need and place a thermometer in the measuring cup. I let it cool just a bit and when it reads 110 - 115 degrees, I whisk in the yeast and then a pinch of sugar. (Yeast feeds on sugar but yeast activity may decrease if it comes into direct contact with sugar or salt, so dissolve the yeast in water first, then add the sugar.) I then set it aside to proof for about 10 minutes while I assemble all the other ingredients. By the time I'm set to work on the recipe, the yeast is foamy and ready to go. - After the first rise, the dough is "punched down" to release the carbon dioxide and even out the temperature. But rather than punching, gently press the air out with your hands. - To avoid adding any additional excess flour when shaping the dough, I like to roll it out on a silpat. You’ll only need a very light dusting of flour. - Lightly toast walnuts in a single layer on a baking sheet at 350 degrees F for about 8 - 10 minutes or until they just start to turn golden and give off a light toasty aroma. Watch them closely so they don’t burn and become bitter. - The ground nuts really add to the texture and flavor of the filling. If walnuts aren’t your thing, try almonds or hazelnuts. - I place the baking sheet of buns on top of another baking sheet (“double pan”) before it goes into the oven to prevent the bottoms from getting too brown. - Everything you wanted to know about working with yeast can be found at Red Star. 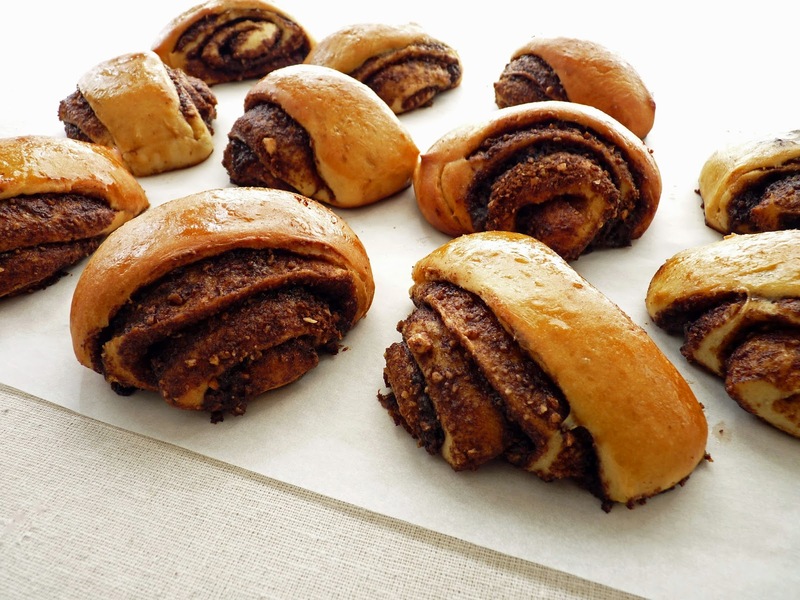 - More fun yeast recipes: Chocolate Orange Cardamom Pull-Apart, Lemon Blueberry Rolls, Challah Knots and Whole Wheat Honey Oatmeal Rolls. For the dough, whisk together 1/4 cup warm water (110 - 115 degrees F) and yeast until thoroughly combined. Add a very slight pinch of sugar. Set aside for 10 minutes. Place the milk, butter, sugar and salt in a saucepan on low heat just until the butter is melted, whisking to combine all the ingredients. Take off the heat, add the vanilla and cool to room temperature. Combine the proofed yeast with the milk mixture. Whisk in the eggs. Switch to a fork and stir in 2 3/4 cups of flour. Keep adding 1 tablespoon of flour at a time until the dough is no longer sticky. Transfer to a lightly floured work surface and knead until the dough is soft, smooth and elastic. Wash and dry the mixing bowl and lightly grease with canola oil. Place the dough in the bowl, turning it over once to lightly coat the entire surface with oil. Cover the bowl with a piece of plastic wrap and set in a warm draft-free place to rise for 1 1/2 hours. Prepare two baking sheets with silpats or parchment. For the filling, place the brown sugar, cinnamon, instant espresso powder, cocoa and walnuts in the bowl of a food processor and process until the nuts are pretty finely ground. Pour into a bowl and set aside. Melt 1 1/2 oz (3 tablespoons) butter and set aside. Make the egg wash by combining 1 egg, 1 tablespoon water and a few grains of salt and set aside. When the dough has completed its first rise, press down on it to release the air. Transfer to a lightly floured work surface and dust the dough very lightly with flour. Roll it out to a 12" x 18" rectangle. Place it so the long side is nearest you. Brush the entire surface with the melted butter. Evenly distribute the filling to within 1" of the top of the long edge. Gently press down on the filling. Starting with the long side nearest you, roll the dough into a tight log and seal the end. Place the seal on the bottom and slice into 12 equal pieces (1 1/2” wide) using a serrated knife. Arrange them on the prepared baking pans, smooth side up. Gently flatten them just a bit so they won’t topple over. They will naturally fan out as they bake. Set the baking sheets in a warm place for 1/2 hour. For the glaze, combine the boiling water and instant espresso powder together. Add the sifted powdered sugar and vanilla. Whisk until the sugar is fully dissolved. Set aside. Place the baking sheets on top of another two baking sheets (double pan). Brush the top of the buns with the egg wash (you’ll have a lot left over). Bake until the buns are a golden brown, about 24 - 25 minutes. Place the pans on a wire rack and brush the buns with the glaze. Cool. Today is the first day of Spring! For me, that means flowers and gorgeous fruit in abundance. Strawberries are appearing and soon there will be a burst of the bright color of stone fruit in our markets. After months of the brown earth tones of nuts, spice and chocolate, we have the promise of some bright and beautiful pastries up ahead. Sweet and salty snacks in the form of peanuts, pretzels and chocolate always appear high on the list for Americans. So why not put them all together into one gooey little bon bon? What is a bon bon, anyway? The term bon in France simply means “good.” And in France a bon bon refers to just about any little candy. But in America, they are usually a confection of some sort dipped in chocolate or small scoops of ice cream dipped in chocolate. This recipe rolls together the happy combination of peanut butter and pretzels with the help of some brown sugar and vanilla. Then it’s a quick dunk in melted chocolate and voila! You have a very simple and delicious little bite that can be stored in your freezer for whenever the snacking mood strikes. - This is a bit of a messy process. But that’s what makes it kind of fun. Keep the filling well-chilled at all times so it doesn't get super sticky. 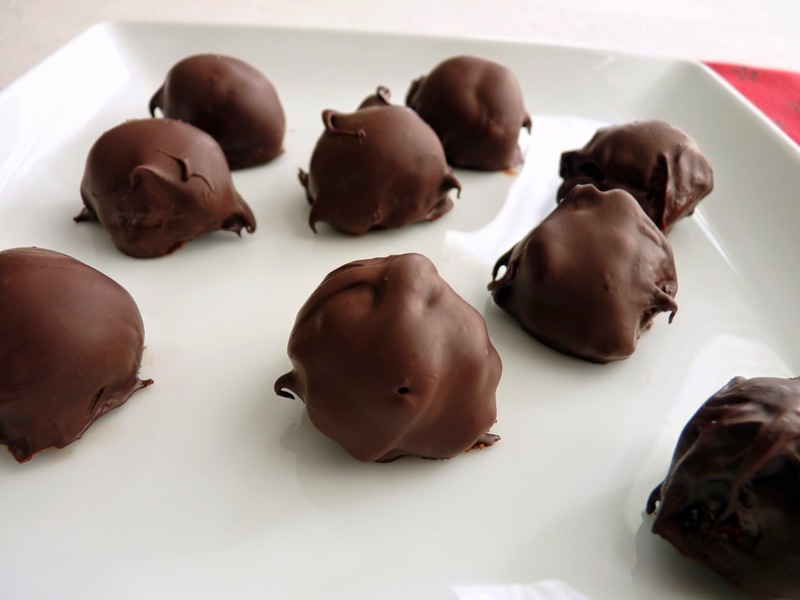 - I portioned the bon bons with a truffle scoop. - I like dark bittersweet chocolate (72%) but use semisweet (62%) for a sweeter version. - Let the melted chocolate cool just enough so it won’t melt the peanut butter filling when you dip them. 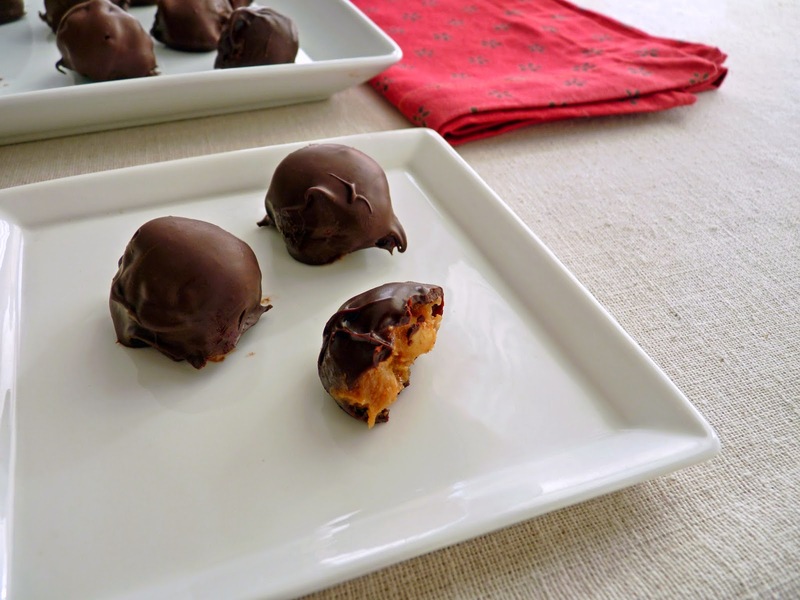 - Garnish the tops of the bon bons with crushed peanuts or a light sprinkle of salt. Line a baking sheet with a silpat or parchment. Crush the pretzels into smallish pieces and coarsely chop the peanuts. Set aside. Combine the peanut butter, butter, brown sugar and vanilla until smooth and fully combined. Fold in the pretzels and peanuts. Chill until the mixture is very firm. 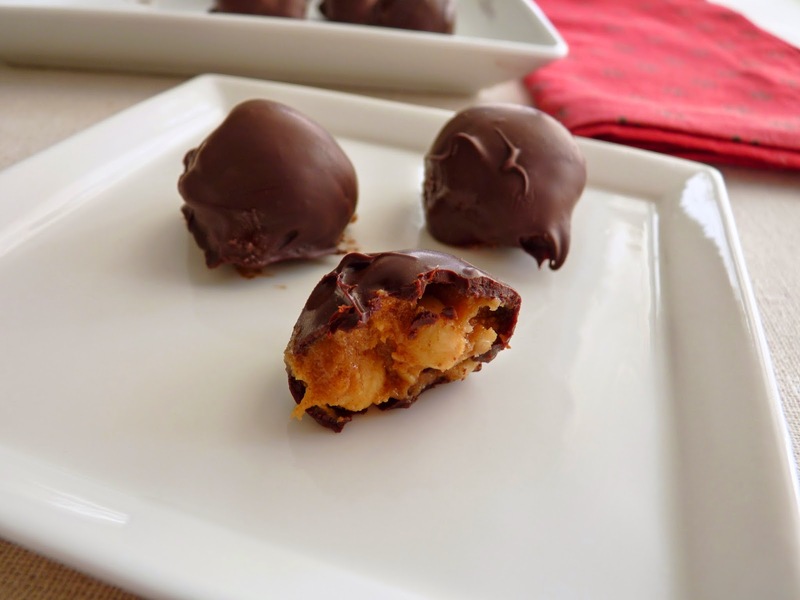 Scoop or shape the peanut butter mixture into 1” balls. Chill. Finely chop the chocolate and place in a heatproof bowl over a saucepan of about 1" of barely simmering water, making sure the bottom of the bowl is not touching the water. As the mixture melts, stir to combine. Remove from heat and cool for just a couple of minutes or so. Using a fork, dip each bon bon in the melted chocolate, letting it drip for a moment and scraping the bottom of the fork against the edge of the bowl to remove excess. Place on a silpat or parchment lined baking sheet to set up. Chill until firm. Place the bon bons in a single layer in an airtight container and store in your refrigerator or freeze for longer storage. 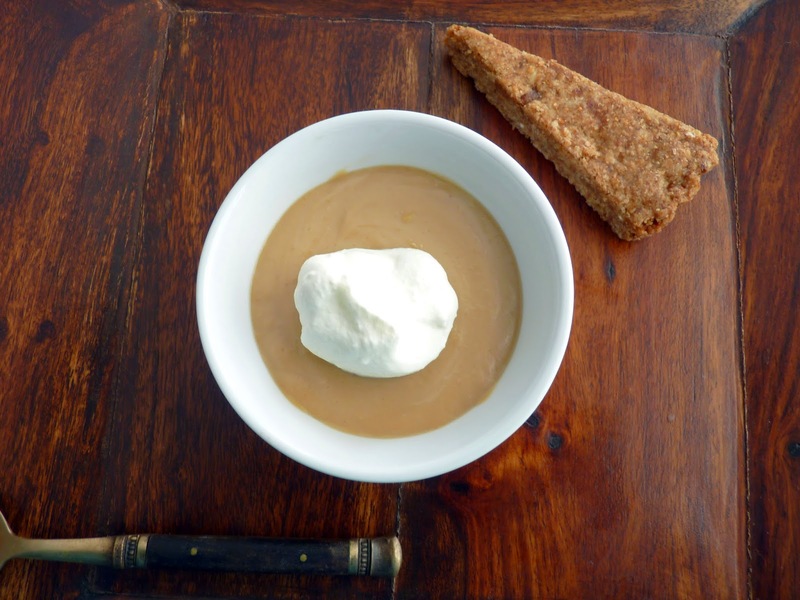 In the realm of creams and custards, there are a few distinctions. Custard is a cream and egg based mixture baked in a water bath to ensure slow and careful cooking. Pot de crème is traditionally baked in porcelain cups and is usually a little looser in texture. Pudding is cooked on the stovetop and contains fewer eggs and a measure of cornstarch and/or flour as a thickening agent. Toffee sauce is brown sugar and butter heated just to the point where the sugar is fully dissolved. And since brown sugar contains a hint of molasses, it has a distinct flavor. Toffee differs from caramel in that caramel is made with white sugar and is cooked until it reaches a rich dark amber stage. Cream is usually added to turn it into a sauce. They each have a different viscosity, sweetness and richness. 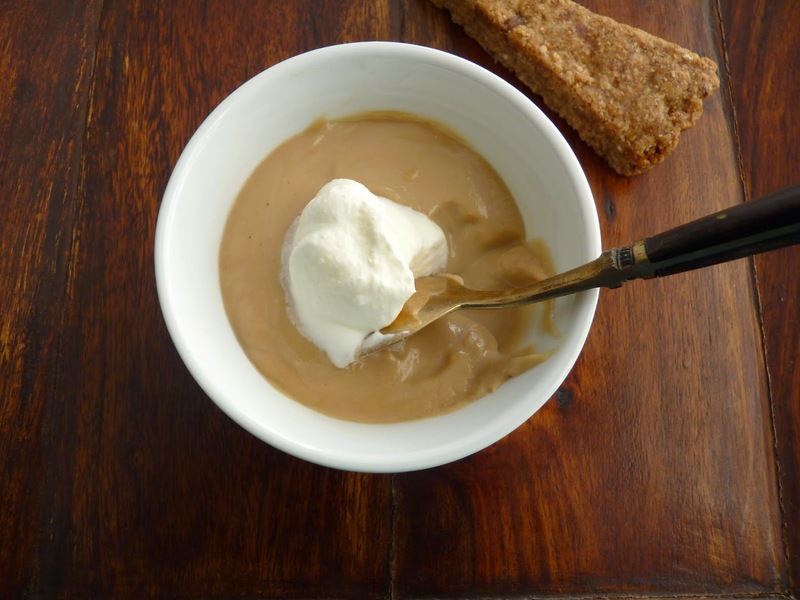 This is an easy pudding that combines the deliciousness of toffee with the creamy makings of a coffee flavored pudding. It’s super simple and a wonderful union of ingredients for anyone who enjoys any one of these elements. You can make it ahead and chill until ready to serve. Then when you’re ready for a treat, just add a dollop of freshly whipped cream and sit back and savor, spoonful by spoonful. - Use your favorite dark roast coffee beans for the very best flavor. - Leave the coffee beans whole. If ground or crushed, they tend to absorb too much of the milk. - These custards will keep in your refrigerator for a day or two. - The cookie used as a garnish in the photos is Brown Butter Walnut Shortbread. 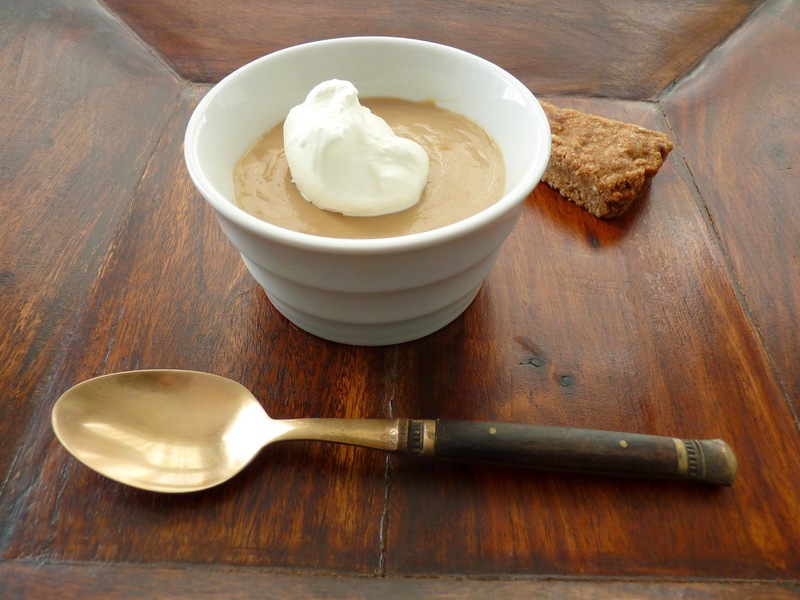 - For the simple and sublime, try the purely luscious Vanilla Pudding. For the toffee, melt the butter in a saucepan over medium low heat. Add the brown sugar and whisk until fully combined with the butter. Bring it to a slow boil, whisking constantly. Whisk in 1/4 cup heavy cream. Continue to whisk over low heat until there are no lumps of sugar and the mixture is a smooth sauce. Remove from heat and add the lemon juice and salt, to taste. Set aside. For the pudding, place the milk and coffee beans in a saucepan and bring to a slow simmer. Turn off the heat and steep for 1/2 hour, then strain and discard the coffee beans. Return the milk to the heat and bring to a slow simmer. In a separate bowl, whisk the egg yolks together. Add cornstarch and whisk until thickened and smooth. Slowly pour about a third of the warm milk mixture into the eggs, whisking thoroughly to combine. Add remaining milk and continue whisking. Add the toffee mixture and combine thoroughly. Pour the mixture back into the saucepan and return to medium low heat. Bring to a very slow boil, stirring constantly with a heatproof rubber spatula or flat-bottom wooden spoon. Once it begins to bubble, reduce the heat to low and continue to cook for about 2 minutes, stirring constantly, until the pudding thickens. The pudding is ready when it coats the spatula and a finger traced through it leaves a clean track. It will thicken more as it cools. Remove from heat and add the Kahlua and vanilla. Taste and adjust for salt. Pour into ramekins and set aside to cool. Place in the refrigerator to chill and set up. To serve, whisk heavy cream, sugar and vanilla until soft peaks form. Dollop each custard with whipped cream. While I know there are vast parts of the world covered in hideous amounts of snow right now, I have been working on ice cream. But it’s a whiskey ice cream so maybe that helps just a tiny bit to ease the chill. 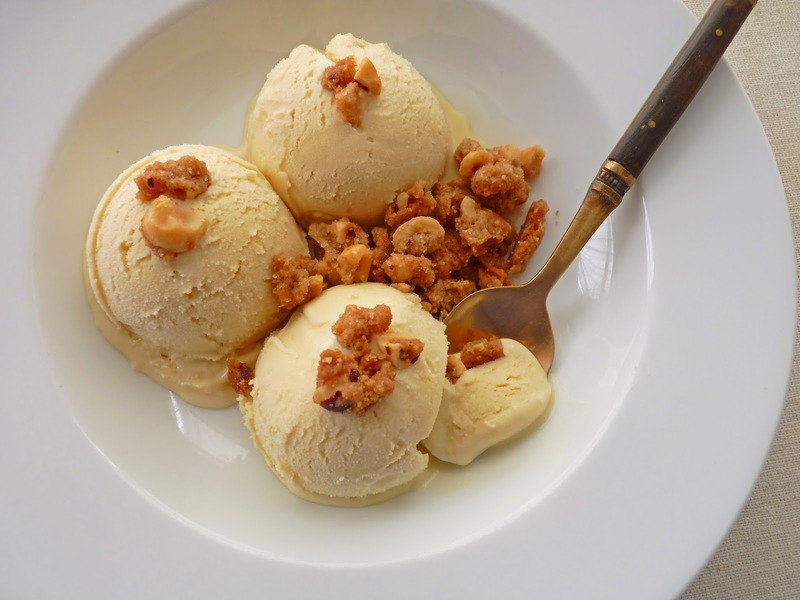 This is a pretty simple ice cream so use your best and favored whiskey. I add a little nut crunch for some contrast and texture, choosing hazelnuts for their earthy complement to the whiskey. 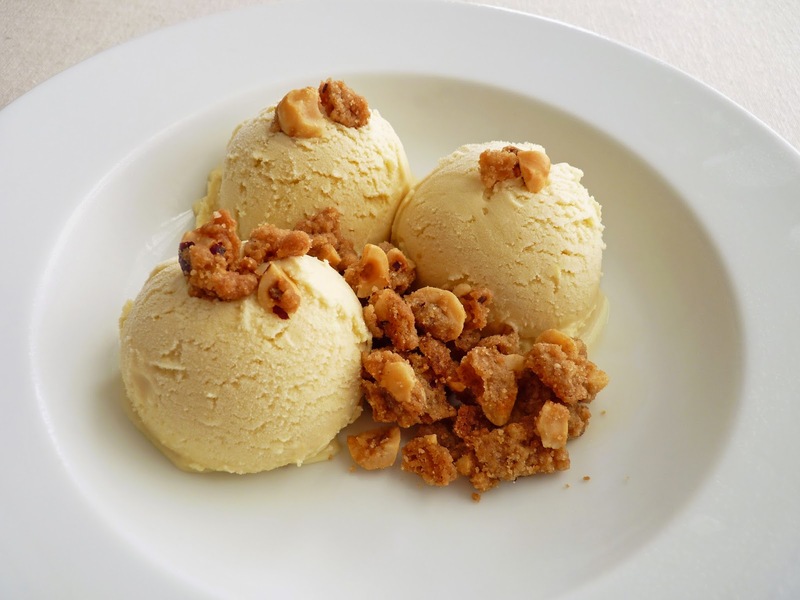 Both the ice cream and crumble have a bit of dark brown sugar to soften the flavors. I say bundle up, get cozy and have a little nip in a bowl. Cool comfort awaits you. - Cook the ice cream base over medium low to medium heat and stir constantly. You do not want the custard to boil, so the stirring is necessary to keep the custard moving, preventing it from heating too fast and turning into scrambled eggs. I use a heatproof rubber spatula when I’m cooking ice cream bases. It’s perfect for making sure you're scraping the bottom of the pan continuously in wide strokes. If it looks like the custard is heating up too fast, lower the heat and lift the pan off the burner until it cools down. - Salt is really important in this mix. It makes the flavor pop. Keep adding a few sprinkles until you get it right. You’ll know as soon as it happens. - I like this best without the addition of vanilla but it can be added along with the whiskey at the end of cooking if you prefer. - To toast hazelnuts, spread them out in a single layer on a baking sheet and toast in a 350 degree F oven for about 10 minutes. Rub them in a towel to remove most of the skins. 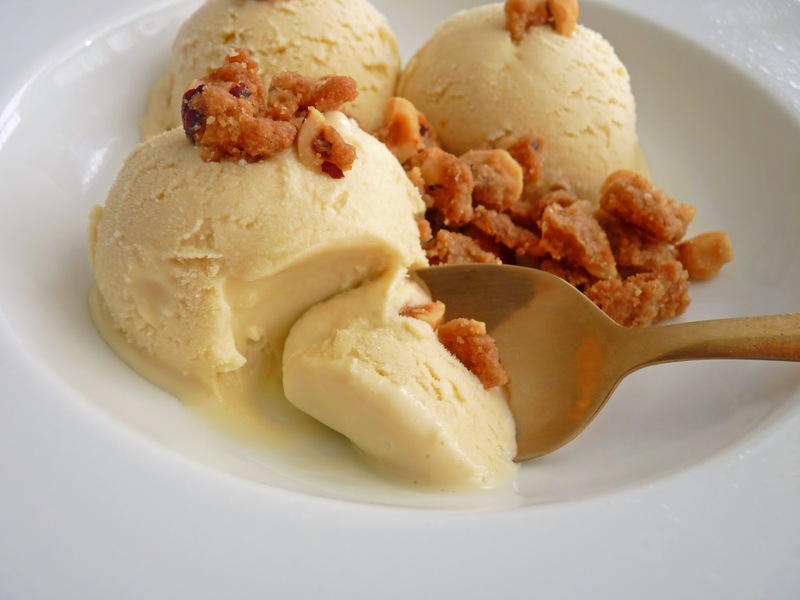 - If you'd like to warm your serving up a bit, I think this ice cream would also make a great affogato (Italian for "drowned"), which is a couple of scoops of ice cream with a shot of espresso or strong coffee poured over it. Combine the milk, cream, both sugars and a pinch of salt in a saucepan and bring to a low simmer over low heat just until the sugar is dissolved. Do not boil. Whisk the egg yolks in a medium bowl. Slowly add the warm cream mixture, whisking constantly to keep the eggs from scrambling. Return the mixture to the saucepan and medium low to medium heat. Cook, stirring and constantly scraping the bottom of the pan, until the custard thickens and coats the back of the spatula. A clean track should hold its shape when you draw a line with your finger across the spatula. Take off heat and immediately pour the custard through a strainer into a clean airtight container. Stir in the whiskey. Taste and adjust for salt. Cool completely, then cover and refrigerate until thoroughly chilled, preferably overnight. Freeze in your ice cream maker according to instructions. Pour into a clean airtight container, press a piece of plastic wrap onto the surface, cover and place in your freezer to firm up. For the hazelnut crumble, whisk together the flour, sugars, cinnamon and salt until thoroughly combined. Cut the butter into small pieces and place on top of the dry ingredients. Toss the mixture, thoroughly coating the butter with flour. Rub the mixture together between thumb and fingers of both hands until all the butter is worked into the dry ingredients, pinching it here and there until it collects and resembles coarse crumbles. Coarsely chop the hazelnuts and mix them in. Chill for about an hour or so. Heat the oven to 350 degrees F. Prepare a baking sheet with parchment or a silpat. Spread the crumble in an even layer and lightly pat into a rectangle about 10” by 7”. Bake the crumble until browned, about 10 - 12 minutes. The mixture will look like a sheet of cookie crumbles. Let it cool completely to set up. Break into small pieces and store in an airtight container.